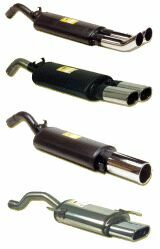 Supersprint Inc. was formed in 1955 with the objective of designing and building the highest quality exhaust systems in the world. That objective has been the driving force behind each Supersprint product from the first system built to those being developed for the future. When you purchase a Supersprint product you can be assured it is the highest quality available. Every Supersprint system has been researched, designed and tested to insure additional power and to enhance overall performance. All design is validated by extensive testing which includes hours of dyno testing on Supersprint's Maha 4-wheel chassis dynamometer. In fact no other exhaust manufacturer, race team engine testing department or car manufacturer has the performance evaluating experience of Supersprint. Global Autoshop carry full line of Supersprint Products, please contact us for more information.